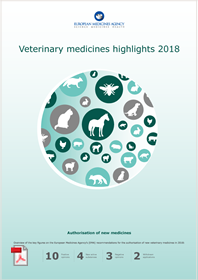 EMA has published an overview of its key recommendations of 2018 regarding the authorisation and safety monitoring of veterinary medicines. In 2018, EMA recommended 10 medicines for marketing authorisation. Of these, four had a new active substance and three were vaccines. A selection of these recommendations can be found in the veterinary medicines highlights document released today.